At the invitation of Late Bishop Jerome Fernandez of Quilon Diocese, Vincentians arrived in Quilon in the year 1974. As a temporary arrangement, Fr. Mathew Peruvelil reached Kunnam (Mavelikara) as the chaplain to the MSST Sisters and for the care of the catholic population there. In 1976, a proper plot was acquired at Keralapuram and in the month of June, Keralapuram was erected a Parish bifurcating the Chemmakad Parish and Fr. Cherian Kariankal was appointed as the first Parish priest. In 1980 foundation stone was laid for a retreat center for the priests. On 15th August 1981, Bishop Jerome Fernandez and Bishop Joseph Fernandez of Quilon blessed the church and the retreat center. In the year 1980, an English Medium School was begun at Keralapuram. In the beginning, D.C. Sisters looked after the school. Later on, they entrusted the school to the Congregation. 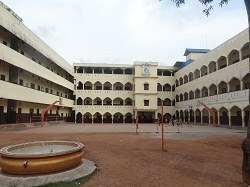 At present the school has around 2000 students and the parish has around 225 families.